One of the very few modern distilled Spanish absentas. 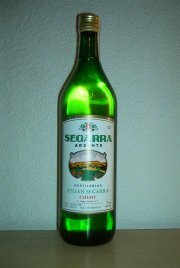 The Segarra distillery usually makes excellent brandy and then there's this quite special absinthe. I had heard so much about this one but was still not quite convinced that it could actually be all that good. At the "low" 45% it sounded like another renamed pastis or something. But I was wrong. It has a very nice taste. It's round, full, slightly bitter and the anise. Along with that a very specific taste only found in the Segarra. It's got this kind of woody finish, from the aging in old brandy oak casks. It's actually very good. The anise is quite dominant but not as sweet liquorice as in many others. And with the sting of the wormwood it's a very nice blend. Its color is light green and yellowish and it louches very nice into white when water is added. All in all I find this to be a very refreshing drink and I'll have many more of this. The only thing that really disappoints me though, is the bottle and the price. The label could definitely need some work, it's ugly. But once you get to the inside the bottle, it's a good experience.